Welcome to BJARS.Com! This site is designed to be an online repository of useful tools, resources, demos, source code and disassemblies related to the Classic Video Game consoles, primarily the Atari 2600 and Atari 7800. I've also added some of my old Commodore 64 games from the early 80's, and will probably be adding some old Windows games that I made too. You'll also find lots of other original Atari homebrew games, game hacks, and custom applications developed by myself available here. I occasionally search AtariAge.com, Google, and other classic gaming related websites for useful info, code, and disassemblies. I'm sure there's a whole lot of great content out there that I've missed. If you'd like to submit something classic gaming related to be included on this site send me an email at sescreen-atari at yahoo dot com. My new homebrew games "Gate Racer II" and "Jungle Adventure Demo" added on 12/31/2013. Added new source code for Elevators Amiss by Bob Montgomery, Star Castle by Chris Walton & Thomas Jentzsch, Hunchy 1k by Chris Walton, Halo2600 by Ed Fries, Blinky Goes Up by Jans Hermanns, and Muncher by wickeycolumbus on 12/31/2013. 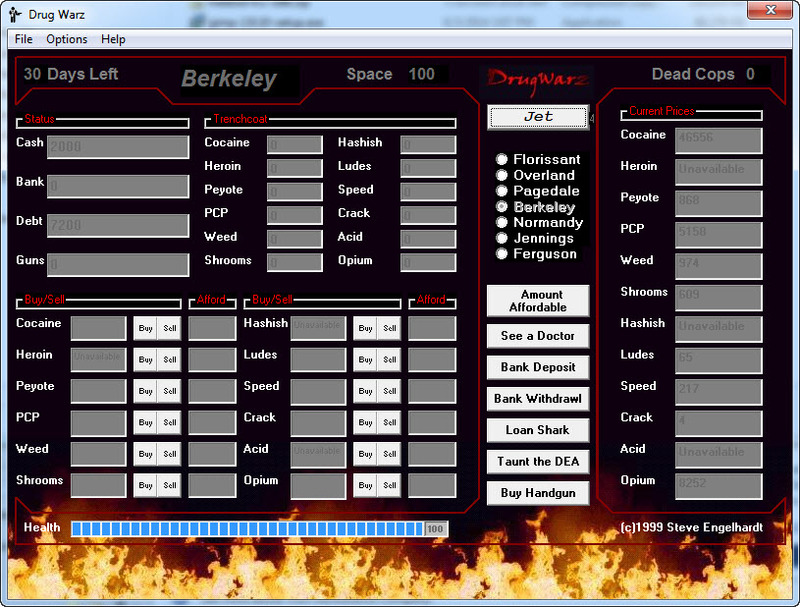 Added Fully commented disassembly of Demon Attack by Angelo Zizzari on 12/31/2013. Added six new River Raid Hacks on 1/7/2014. See my hacks page to download them. My favorite is River Raid Turbo - your ship flies much faster. Added three demos on 1/17/2014 to the 'Homebrew Demos' section on the Source Code page (INV3, River Rampage and Zelda Demo). Added a section for all the Two Button hacks for the 2600 using the Sega Genesis Controller along with the disassemblies of 13 of them on 1/20/2014. Added my new Battlezone Trainer hack to the hacks page on 1/21/2014. 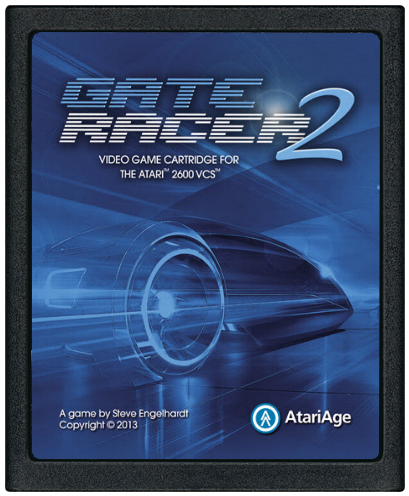 Added new box art and a French/English version of the manual for GateRacer II on 2/28/2014. Special thanks to Horeus at Allgamers.fr for sharing those. I also added the new "Favorites" and "My Original C64 Projects " sections to this page. I started the favorites section with lots of downloads related to Indenture, and the C64 section with the very first game I ever wrote, Cave Dave. Lots of new content related to the Atari7800 was added on 7/17/2014. The entire page is brand new, check it out here. Added my latest Atari 2600 game Touchdown Challenge and some old Windows based software I wrote here on 7/17/2014. My new homebrew game "Diamond Drop" added on 3/18/2015. 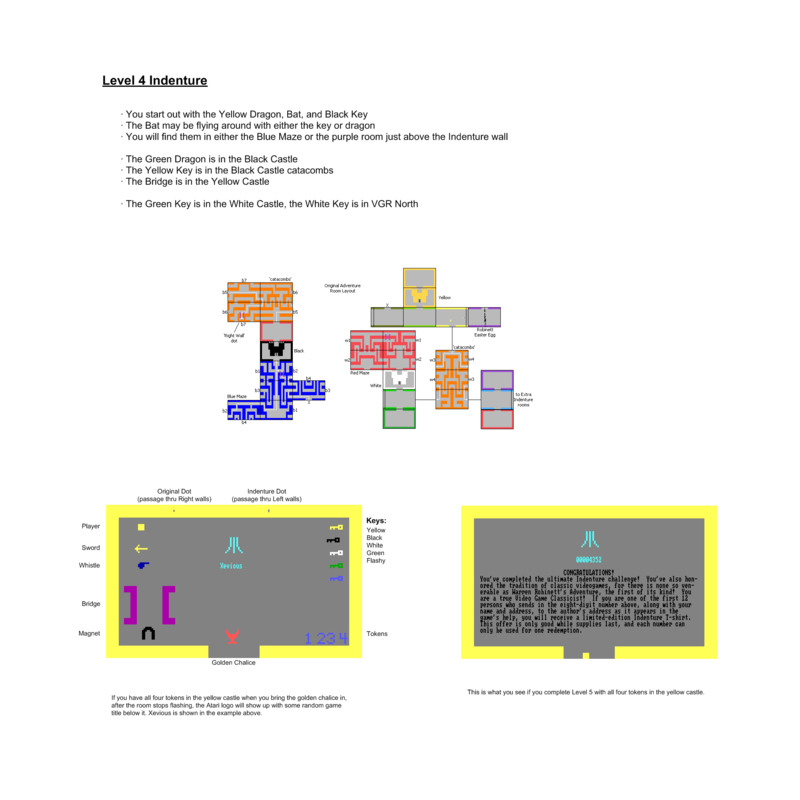 My new 7800 homebrew game "Dungeon Stalker" added on 4/8/2015. Added my latest 7800 homebrew game "Boom!" on 6/9/2015. Added a page dedicated to my mame cabinet build on 6/9/2015. Cave In is a large adventure game for the Atari 2600, inspired by the 2600 versions of Raiders of the lost ark and Adventure. Click Here to jump to the Cave In area of my website, which includes the instructions on how to play the game, as well as other files and documents I created during the development process. For more info, you can visit the AtariAge forum thread here. Would you like to see CaveIn in action? Download the Level One Playthrough here. Be warned, it shows how to beat the game, so don't watch if you want to figure it out for yourself. You'll notice throughout the game that I seem to be recharging myself. 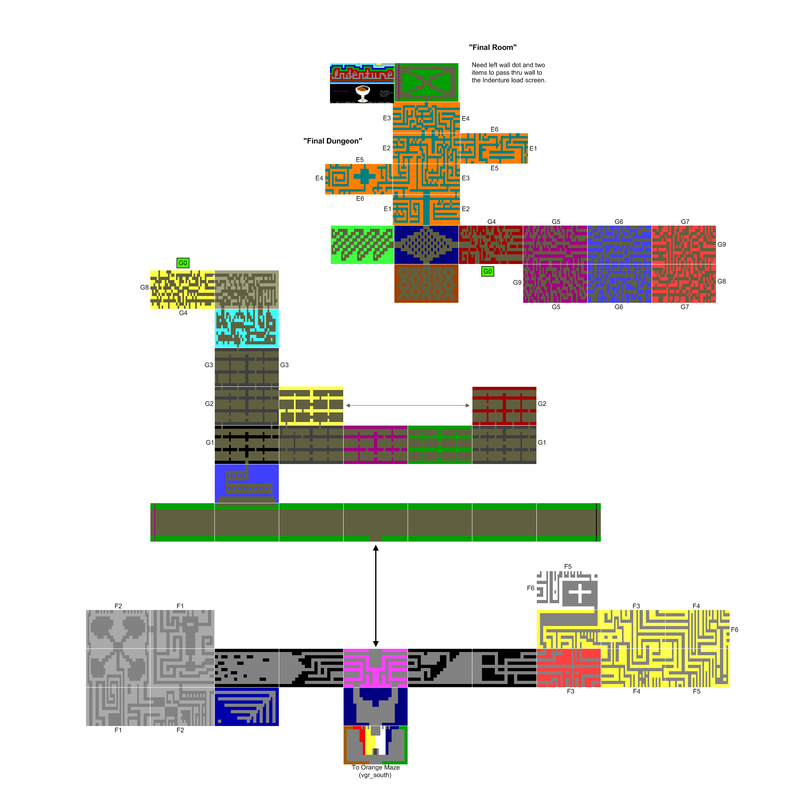 There is a health cheat in the game, you can look at the Cave In of my page for more info on various secrets I revealed several years after it's cartridge releease. 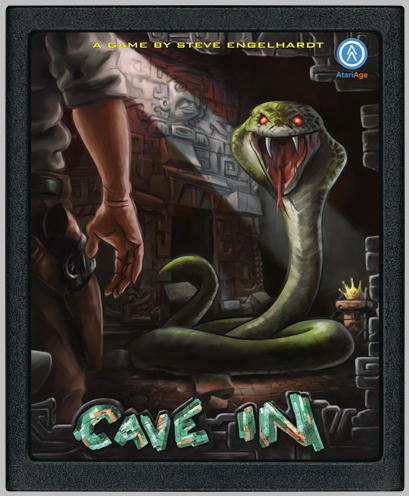 Cave In is available for purchase on cart at the AtariAge store. The $30 purchase price includes the cartridge and a professionally printed manual. You can see screenshots and download the game and manual on bjars.com here. If you'd like, you can also purchase a professionally printed box for the game for an additional $30. All of my proceeds for Cave In will be donated to Autism Speaks. Autism is one of the fastest growing developmental disabilities in the US, with 1 in 91 children being diagnosed (as of October 2009). It knows no cultural or racial boundaries, and that number is increasing every year. My son was diagnosed with Autism at the age of two, 9 years ago. So much has been discovered and learned since then, but there is still no cure. By purchasing Cave In you're not just getting a great game for the Atari 2600, you're also contributing to a great cause that needs everyone's attention, and you're helping to fund research that will hopefully find a cure. Thank you for your support and your interest in Cave In, and for helping my wife and I support Autism Speaks. Just like in the original Gate Racer, the object is to drive through the scrolling gates while avoiding hitting the barriers, sides of the road, or oil slicks. This version was expanded to 4K to include some new options. New to Gate Racer II is the addition of an options screen that lets you customize the difficulty of the game, as well as a high score save option. 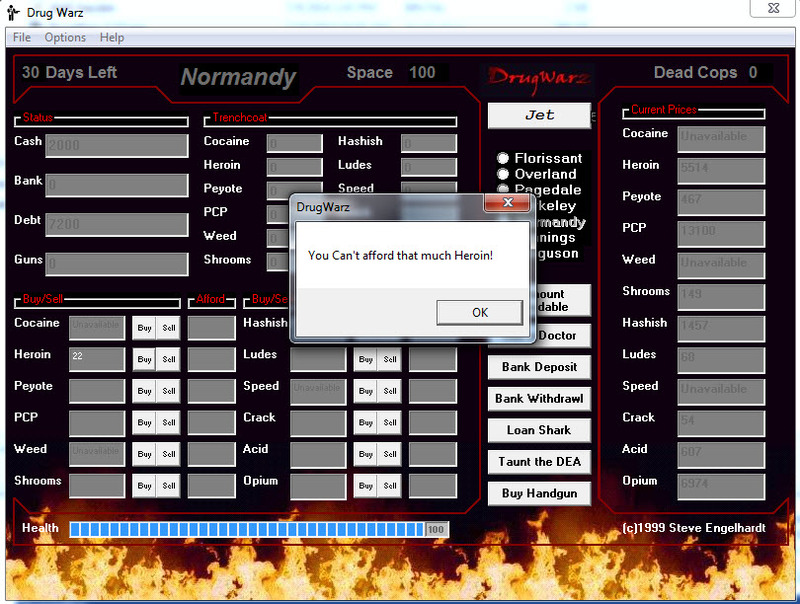 The default options are how I generally play the game and match the 2K version. The new selectable options are Velocity (on/off), Oil Slick (on/off), Car Size (big/small) and Powerup (on/off). The basic gameplay is the same, there's a clock timer (that shows minutes/seconds/tenths of seconds) at the bottom and the object is simply to survive on the road as long as you can. Your final time is displayed when you crash. 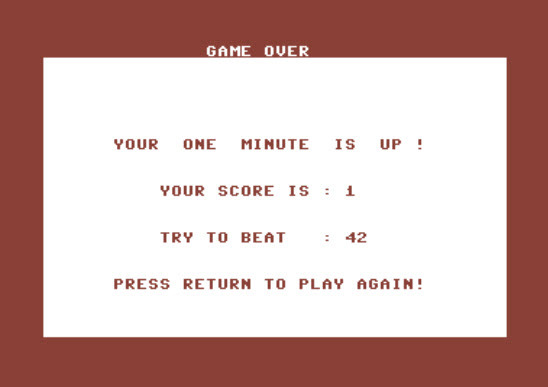 Hitting fire then restarts the game to the title screen, saves your high score if it's higher than your previous time, and displays your high score at the bottom of the title screen. If you want to compile this game yourself, you'll need all of the modified batari basic include files (in a zip file in the downloads section) along with the Atarivox include files from AA user RevEng's post here. The original AA Thread about this version of the game is here. Gate Racer II had a limited production run of 20 carts and it is no longer availble for purchase from me. You can have a custom cart made at AtariAge.com, but it may not include the label. 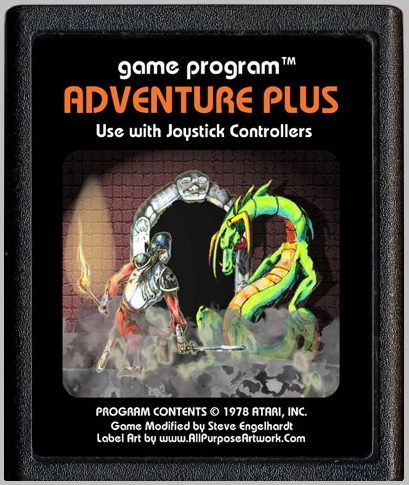 Adventure Plus is a hack of the original 2600 Adventure game. It features many changes over the original, below is my original list of changes. It is available for purchase on cart at the AtariAge store. Title Screen Added ("Adventure+"). Thanks to Channel 2, who helped removed the flicker. The Left and right border walls have been removed in the main corridor (underneath the original location of the yellow castle), allowing you to warp from one side to the other. Game 1: Red Dragon added, one new (semi-hidden, accessible only with the bridge) room added to blue maze, many item locations changed. Game 2: Many items are in new locations, including the Chalice. If you have trouble finding the Chalice, drop us a line and we'll give you a hint. Dragons changed to look more like dragons and less like ducks. Chalice, magnet, castle gates, sword, level select numbers, and bridge graphics all changed. Castles made wider at the top, for no particular reason. A Plus("+") sign was added in the castle gate graphic. Barrier Obstacles added to the corridor rooms. Main Corridor colors changed to dark blue and dark purple from the previous shades of green. Yellow Castle and Black Castle moved to different locations. The two "top entry rooms" near the white castle were moved, and the original entrances to them were closed off. I recently added my new Atari 7800 homebrew game "Dungeon Stalker" as well as my new Atari 2600 homebrew game "Diamond Drop". Dungeon Stalker is my first game with AtariVox Speech, that was incredibly fun to work on! It's still a WIP but should be in the AtariAge store sometime this year. I clicked on every single link on this site and everything should be working now. That took a really long time! 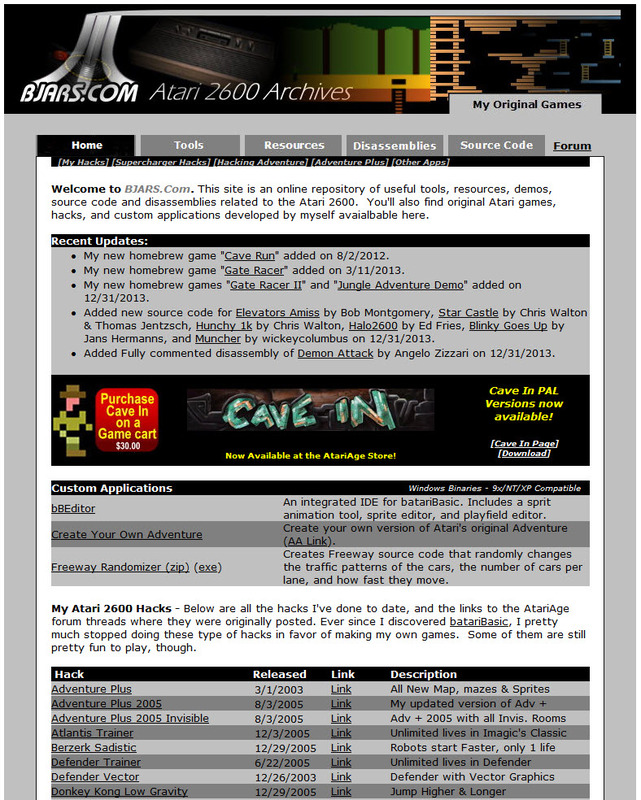 I updated the top graphic to remove "Atari 2600 Archives" and change it to "Atari Archives" since the site includes more than just that now. I just added a new Atari 7800 tab, there's lots of new 7800 related content. I've recently started using RevEng's excellent 7800basic programming environment and have started development on some 7800 homebrew games. All of the picture links are fixed and I'm just getting started on checking all of the download links. There are hundreds on this site and all of them need to be verified, it will take a while. The site went down on July 9th due to going over my 1GB bandwidth allocation. I contacted Al at AtariAge.com and he agreed to host the site. It was moved on 7/10/2014. This should finally be the end of site outages due to bandwidth consumption! Many thanks to Al for hosting my site. Due to differences on the server that hosts the site regarding case sensitivity some links may be broken and that will take time to fix. If you notice any broken links starting in August 2014, feel free to email me at se-screen at yahoo dot com, prior to that I will be slowly reviewing each page to make corrections. In addition, the hosted forum I was using will no longer function. I am looking at alternatives, but for now it is down indefinitely. 2/28/2014: Bandwidth was not exceeded in February! It's the last day of the month so I did a quick check on bandwidth consumption. I'm at 633MB as of this morning, which is 63% of my allowance. I guess most of the bandwidth last month was from myself and the tons of transfers done with the site overhaul. For the first time since I created this website in 2006 I exceeded the traffic quota of 1GB that's imposed by my web host, doteasy.com. That's all you get with their no-cost plan. I suppose some of the traffic was from myself this month with all the updates I was making. My apologies if you see the site go down for a few days at the end of the month in the future because of this restriction, I'm not planning on upgrading my hosting plan. I rolled out the new design in only 7 hours, every page was created new. As I expected, there were broken links and little mistakes on just about every page. It will be an ongoing process, but hopefully I'll have everything nailed down within the next week. I originally designed this site very quickly in 2006 and haven't changed the layout since then. I thought it was time to update it and make it a bit more useful. The original site was very narrow and optimized for an 800x600 monitor, and I think most people have updated from that by now. Don't remember what the site looked like before the redesign? Click on the image below. The older design was much narrower, which limited the number of link buttons I could add at the top and how much content I could squeeze on to one page. I also created an actual home page for the site, the index link formerly took you directly to the hacks page. I just added this section, so right now there's only one favorite item. :) I'm planning on adding Atari related content here that doesn't really fit in anywhere else on the site. Indenture is a DOS based Adventure game written by Craig Pell in 1995-1996. It was based on the original Atari 2600 game Adventure. Craig greatly expanded the game (300 rooms are included), added a couple of new castles, another dragon and even more objects. As a long time fan of the original Adventure, I was excited when I stumbled upon this game many years ago. 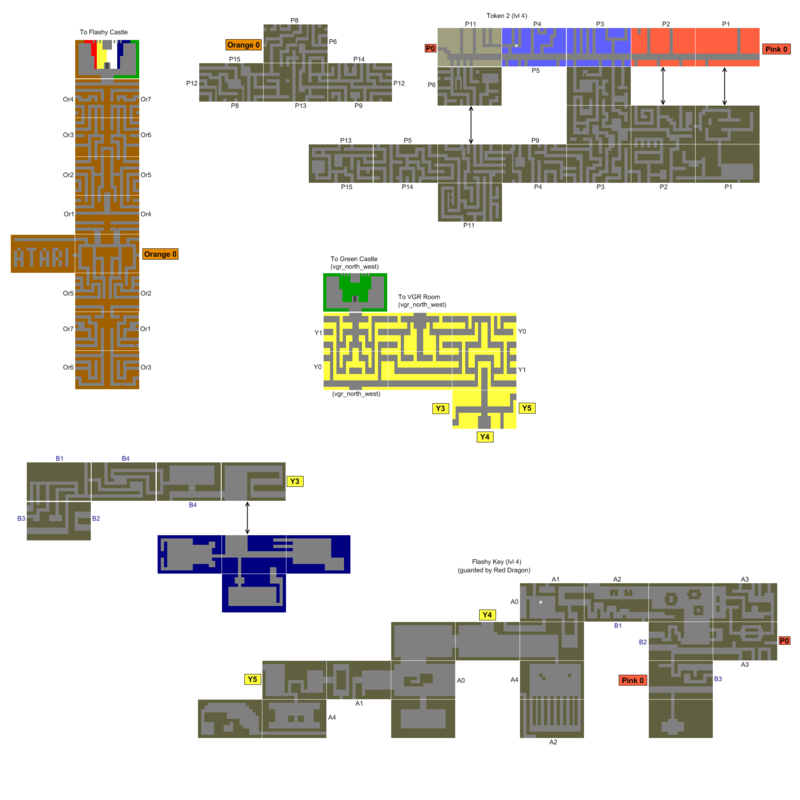 AtariAge user edyensid created a set of maps for the games that are posted below. You can read the original thread here. -q suppress hexidecimal room dump. -a do dump all rooms. no room numbers to see all rooms. I stumbled upon Bob Eichler's Indenture page here when searching for information about Indenture. Rather than just linking to his page I included his content for download here as well. 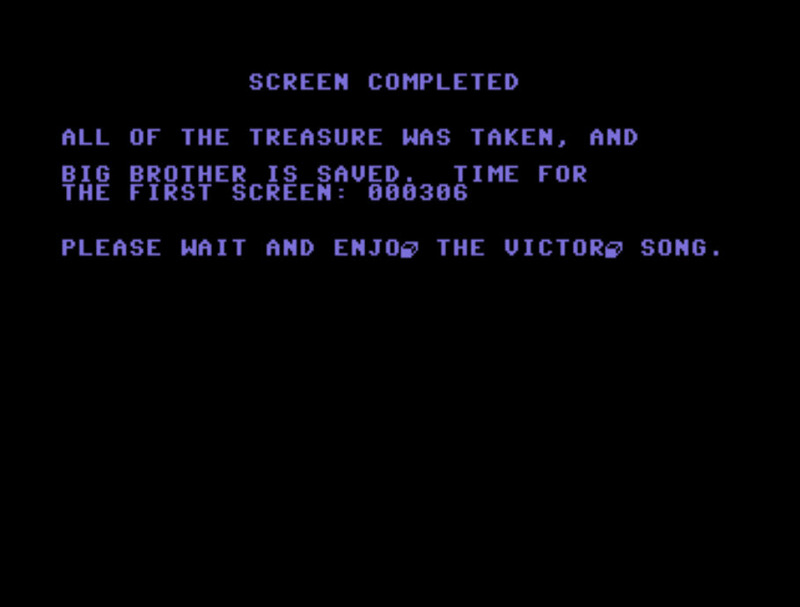 He created a great walkthrough and shared a picture of what the final screen looks like when you win the game. AtariAge user e1will (Will Nicholes) started on an Atari 2600 clone of Indenture. You can read about it in the original thread here. Indenture v1.7 [28k] The official final release of Indenture by Craig Pell. Indenture Source Code [76k] Indenture Source Code, GPL Licensed. DOSBox [Link to Sourceforge] You'll likely need DOSBox to play the game. 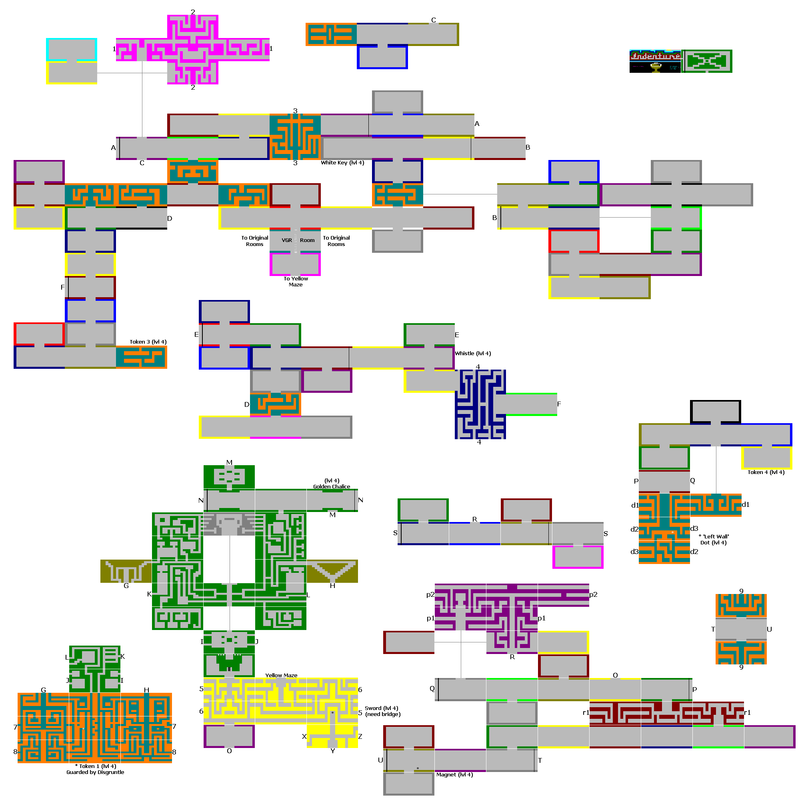 Dumproom Utility [20k] Provides an ASCII dump of the rooms, by Dennis Jenkins. Dumproom Output [258k] An all-room output file from dumproom. Level 4 Walkthrough [322k] This Level 4 walkthrough was created by Bob Eichler. 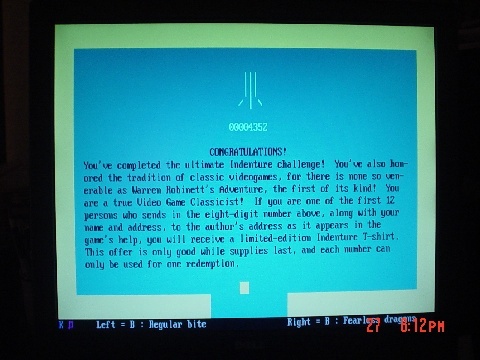 Final Screen [66k] This picture of the final "winning" screen is also from Bob Eichler. Atari 2600 Indenture [32k] This is a work-in-progress original remake of Indenture for the Atari2600 by Will Nicholes. Original Thread is here. What? C64 Stuff on an Atari page? :) Once I moved on from the Atari 2600 my next machine was a Commodore 64, which I absolutely loved. That "READY!" prompt constantly beckoned me to be creative. Thanks to my uIEC device and a C64 app (D64it) that automatically transfers original C64 disks to a D64 on a memory card, I was able to easily archive all of my old C64 stuff from the early 80's. I'll probably add a few more old games and apps I wrote to this section out of pure nostalgia. Cave Dave is special because it's the first game I ever made. I do see the irony of using "Cave" in the name my first game, and then "Cave In" was my first released game. Funny how that worked out! 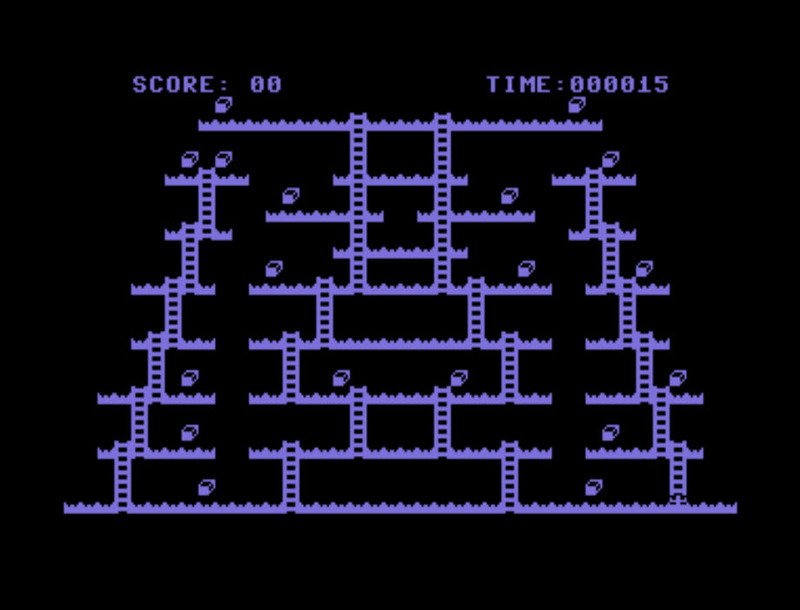 Cave Dave is a simple platform game I wrote as a kid in 1984 using Commodore 64 V2 BASIC. It's the very first time I ever attempted to make a "real" game. I figured out quickly how limited (and slow) BASIC really is. When I was in the middle of designing the 2nd level for the game, all of a sudden random X's were appearing in my code when I'd list it, and Random glitches would appear in the game when it was run even though no changes had been made to the first screen. I assumed at the time that I'd hit the 38,911k RAM limit before I finished the game. The object of the game is to walk around the screen and pick up all the treasures by pushing up and pressing the fire button. Once you've collected them all the ladder to the top platform opens up where you can rescue your brother ('brother' is what I put on the cut scene, I don't remember my original back story anymore). You can't jump. My original intention was to create rolling barrels on the platforms, similar to Donkey Kong, which never happened because I hit that memory limitation. I never learned C64 assembly because I simply didn't have the resources available to me. I knew about it as an option, but never acquired a book or assembler application to even try to learn it. I sure wish we'd had the internet back then! 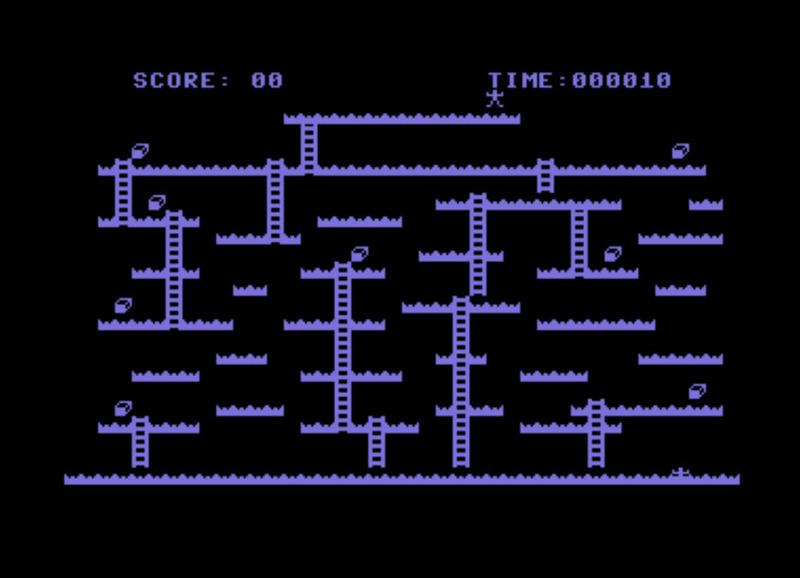 Cave Dave (PRG) The PRG file is compatible with C64 emulators. Drag and drop it on to WinVICE and it'll launch. I used WinVICE for the screenshots. 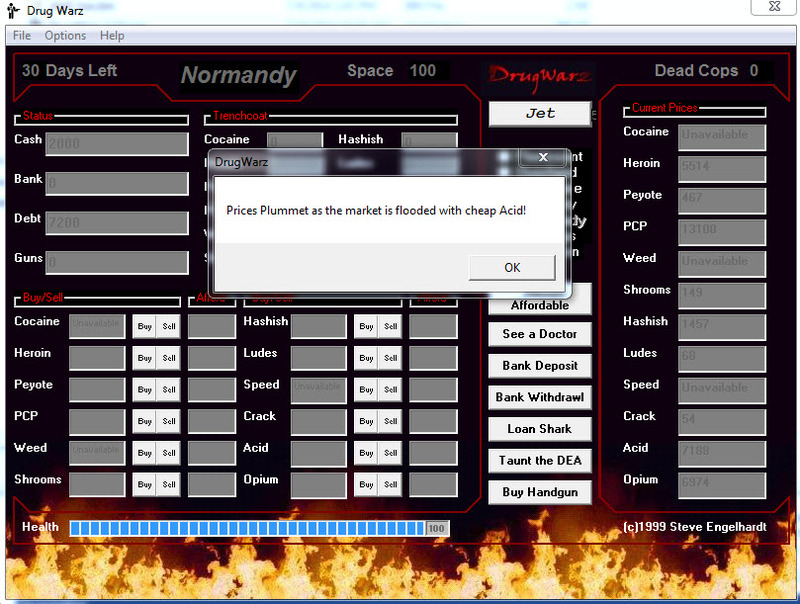 Fireball is another early game attempt, I don't really rememeber much about this one and the source code wasn't dated. I'm guessing it's from 1984. The object seems to be to move back and forth and shoot as many fireballs as you can from the playfield before the 60 second timer runs out. 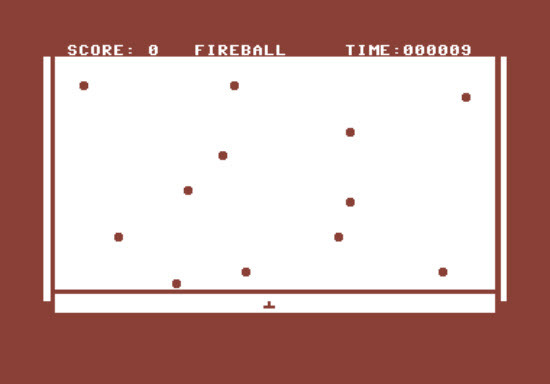 Fireball (PRG) The PRG file is compatible with C64 emulators. Drag and drop it on to WinVICE and it'll launch. Fireball Source (TXT) This is the original BASIC source code, converted to a standard text file. It won't load on a real C64. If I remember right, I created this Tic-Tac-Toe game in high school for a computer science class. The source code is dated 1/7/1988. 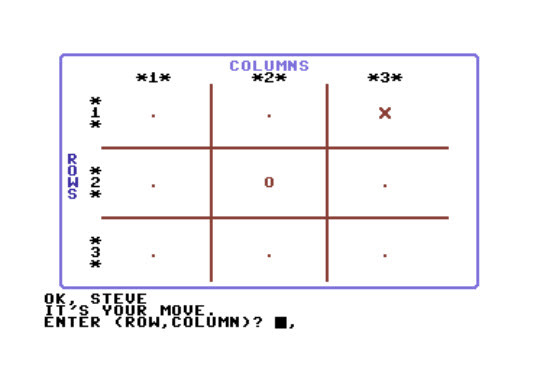 Tic Tac Toe (PRG) The PRG file is compatible with C64 emulators. Drag and drop it on to WinVICE and it'll launch. 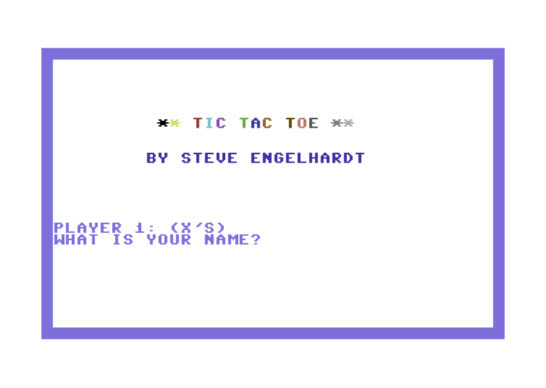 Tic Tac Toe (TXT) This is the original BASIC source code, converted to a standard text file. It won't load on a real C64. 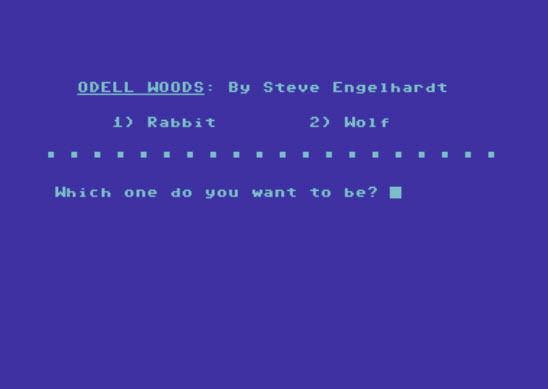 I remember visiting the computer lab at my Father's school in 1983 (he was a teacher) and playing a game called "Odell Woods" on a Radio Shack TRS-80 Model III. 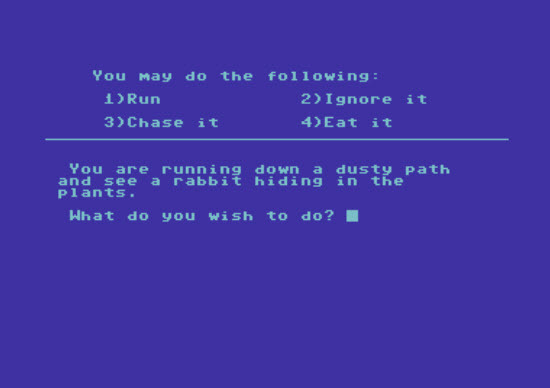 It was a simple text based adventure game that had you walking in the woods and making decisions about what to do. The original game was made by the Minnesota Educational Computing Corporation and the package was called "Odell Outdoor Biology". It also included a game called Odell Lake. I found a copy of the original with a google search, you can dowload the D64 file here. I decided to make my own simple version of the game myself. The source code says that I finished it on 5/9/1984. It's nowhere near as involved as the original that it's based on, but I remember having great fun creating this little knock off. Odell Woods (PRG) The PRG file is compatible with C64 emulators. Drag and drop it on to WinVICE and it'll launch. Odell Woods (TXT) This is the original BASIC source code, converted to a standard text file. It won't load on a real C64. Here's another section of this site that just doesn't fit in anywhere else. 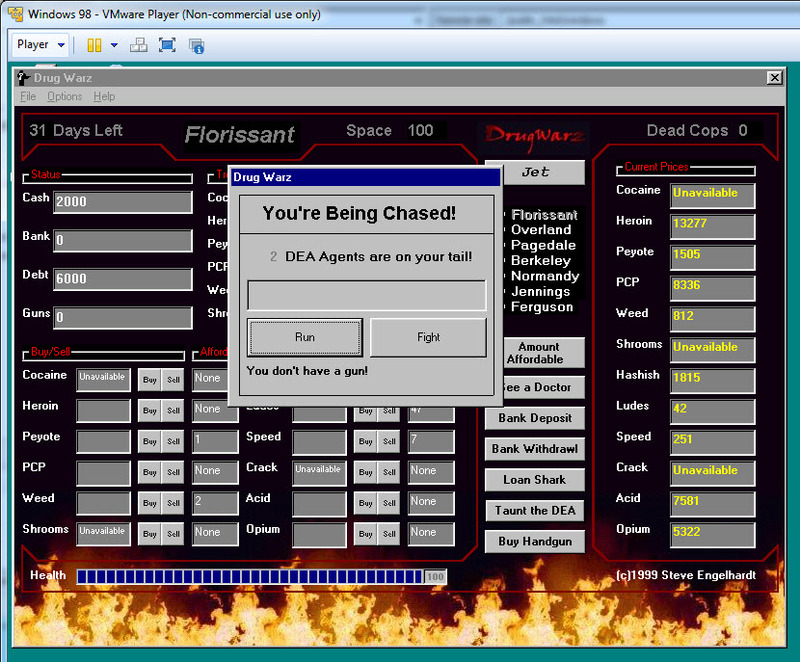 I recently dug up an old Windows game called DrugWarz that I wrote with Visual Basic 4.0 in the mid 1990's. It's a 32bit app. It won't launch on my Windows 8.1 64bit laptop, but launches fine on my Windows 7 SP1 64bit laptop at work. Go figure. You may need an older PC to run this one. I was thinking about it during latest update to this website and found my old DrugWarz website on the wayback machine, it was on Geocities. 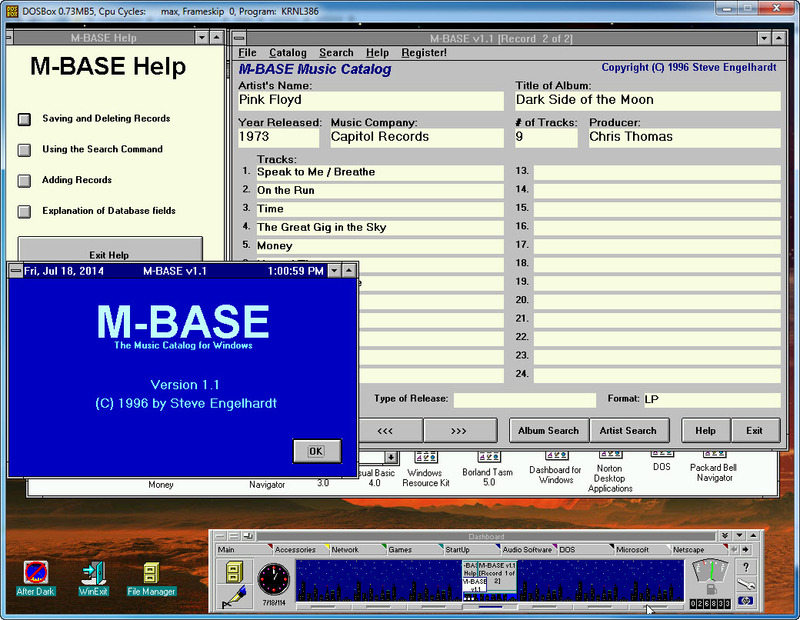 I also found another old app in a stack of floppies called M-Base, a music catalog app for Windows. Here's the original text from my old site (copied from the wayback machine) straight from 1999. 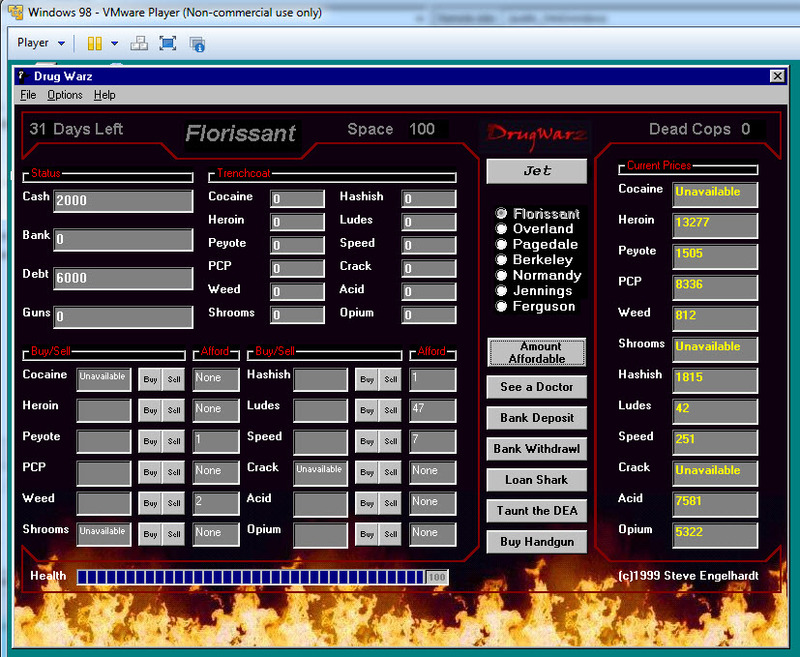 This game is inspired by an old DOS game called Dopewars, which I spent many an hour playing back in the old days. I loved playing the game, but there were many things in the game that I thought could have been improved upon. I wanted to write my own updated windows version, adding more features and changing certain functions of the game I thought could have been done better. It's still a simple, turn-based, single screen, luck of the numbers game, but it's based on the classic gameplay of games made before the introduction of a processor that ran faster than 10mhz! This game is not perfect, it still has a few quirks here and there. It's been a weekend project, and I don't have much time to spend. I'm a network support analyst with a family and a life, which doesn't leave much time for little side projects like this...updates may be few and far between. It's written in Visual Basic 4. Here you go. You'll need to download the comctl32.ocx and vb40032.dll files in order to run the executable. You can put them in the same directory as the executable. If you have an older Win 9x machine you can run the actual setup files. 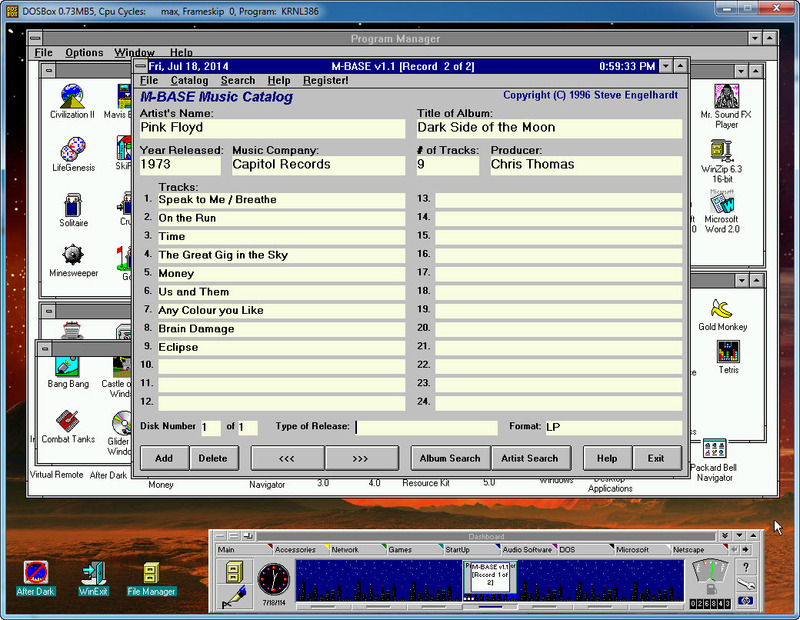 Note that the game runs best on a Win9x system. I successfully got it to run on my Win7 64 bit laptop, but the letters in the app that are supposed to be white and yellow appear grey. Running it via WMWare on an original Windows 98 SE image it worked perfectly. COMCTL32.zip You'll need the comctl32.ocx file to run the executable. vb40032.zip You'll need the vb40032.dll file to run the executable. Original DopeWars DOS game The original inspiration for the game. It's DOS based and from the late 1980's/early 1990's I think. Running on the Windows 98 VMWare image, it looks perfect. Below is what it looks like running on Windows 7 64bit. You can see the numbers are grey and harder to read. There is no installation tool for this one, it has all the files you'll need in the zip and it can be run in any directory. My name is Steve Engelhardt, also known as Atarius Maximus on AtariAge. 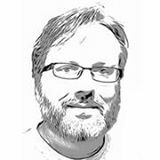 I originally created this site as a useful repository for those interested in learning how to program the Atari 2600, and as a personal site as well to feature the hacks, games, and applications that I've written personally. I've always learned best by example and without these samples of code I wouldn't have been able to complete many of my games. If you're interested in learning, the best place to ask questions by far are the programming forums at AtariAge.Com. There are a lot of people that are passionate about the Atari at AA and are very willing to help out someone who's starting to learn. I'm an IT guy during the day and a family man with kids by night, which leaves very little time to pursue my hobbies. That's why I usually create no more than one game in a year. :) All of my favorite hobbies involve trying to be creative in some way, I like making my own music, my own art, and my own video games. While playing old Atari games is fun I must say that creating them is much more satisfying! Why did I name the site Bjars? Each letter is the first initial of a member of my family.